The London International Boundary Conference Technical Workshop took place at King's College on 17 April 2013. 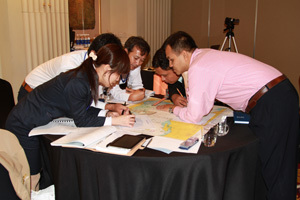 An initiative of the United Kingdom Hydrographic Office, the workshop offered attendees the opportunity to gain a technical perspective of the practical approach to the resolution of maritime boundary disputes. The interactive workshop provided delegates with an understanding of maritime dispute principles before exploring an integrated approach to such disputes within the conference itself. The 2013 London International Boundary Conference workshop involved a combination of lectures and practical sessions using a fictional scenario designed around issues present within maritime delimitation. This session was designed to be interactive to allow for a holistic view of maritime delimitation.